Gruff & Bristle Beard Oil is perfect if you have a big beard, the pump on the 100ml bottle doesn’t mess about, a couple of pumps and you have enough oil to keep your beard looking and smelling great, so if you are fed up waiting for a dripper to deliver enough oil, get yourself some of this oil. I certainly appreciated the pump on this bottle, no worries about spilling the oil and no messing about! The oil is a base of Sweet Almond and Organic Argan carrier oils with a blend of Cedarwood and Lime essential oils, this results in a fresh fresh woodsy aroma that is strong enough to make your beard smell great, but not too strong that it leaves you smelling like a car air freshener. This oil isn’t heavy despite having Argan oil in the mix and yet it was adequate in hold to keep my beard in place. I had wanted to test Gruff & Bristle Beard Oil for a while and so when it arrived I couldn’t wait to test it, but I had to place it in the queue and wait. I have really enjoyed using this oil and it has left my beard feeling naturally soft and smelling amazing. The test of a good oil for me is my skin and this oil has left my skin feeling as good as my beard, I have cropped hair and I sometimes rub a little oil into my head to help with dry skin and this oil worked a treat. Unfortunately I do have to move on to the next product and its hard to do when you have a product like this! 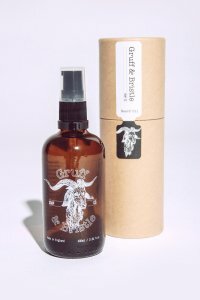 Gruff & Bristle Beard oil can be had for an amazing £16.95 from their website and you can keep up to date with all things Gruff & Bristle on Twitter, Pinterest, Facebook and Instagram. Once upon a time there were three Billy Goats Gruff; Little Billy Goat (Andrew), Middle Sized Billy Goat (Aaron) and Great Big Billy Goat (Ryan), who lived in a field in a green valley (Well, Manchester). They loved to grown great beards but sadly their beards had become dry and barren because they were greedy goats and they’d used up all their beard oil. But they were still in need of it. In the distance they could see a field that was full of lush sweet scrummy oil, but alas there was only one way to get to it – over a rickety bridge over a stream. But under the bridge lived a terrifically terrifying terrible troll/barber called Trevor – And there was nothing he liked better than to shave of Billy Goats beards.Well, that’s just a little Norwegian fairy tale. But the three Billy Goats did have a plan and it wasn’t to cross a rickety bridge with Trevor underneath, it was to create their own beard oil, initially to put on their own beards. Just something to keep the bristles looking and feeling good, and which also kept the skin underneath feeling healthy. If you’re not convinced that you need to add beard oil to your daily routine, here are three tips that will make you a believer.